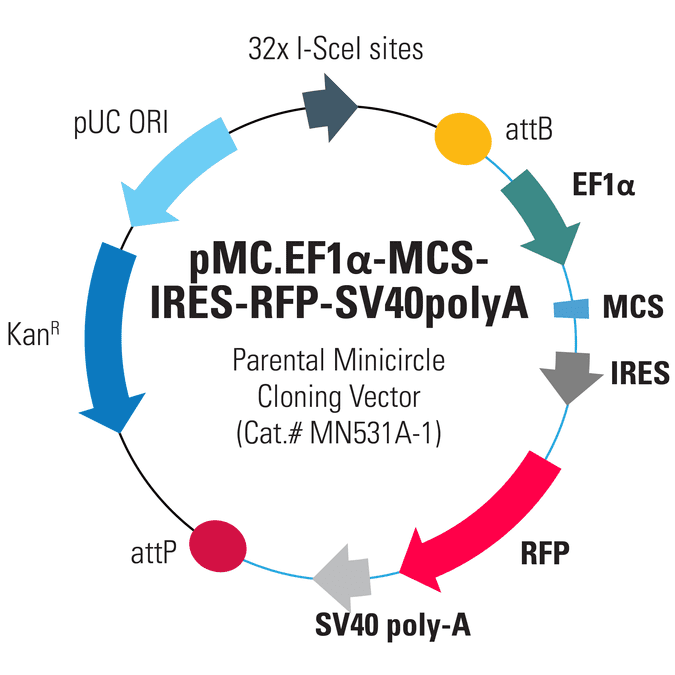 Get all the advantages of Minicircle Technology with the pMC.EF1α-MCS-IRES-RFP-SV40polyA Parental Minicircle Cloning Vector (Cat.# MN531A-1). This Minicircle Cloning Vector contains the necessary sequences to generate a minicircle, and a moderate EF1α promoter upstream of an MCS, so you can clone-in your gene-of-interest and get medium expression levels in most cell types, including primary and stem cells. In addition, this vector co-expresses RFP from the EF1α promoter for coordinated expression of the RFP reporter with your gene-of-interest, facilitating identification of transfectants via RFP imaging.